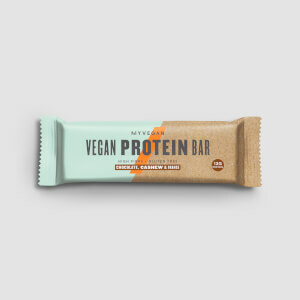 Our Vegan Protein Bar is an all-natural blend of plant-based protein, crafted using the finest cacao butter, chocolate chips, and roasted nuts. They’re gluten-free and contain no artificial sweeteners or added sugars — perfect for a vegan lifestyle. Loaded with 13g of high-quality protein, which helps grow and maintain important muscle,1 they support your fitness goals in a delicious way. There’s 12g of carbs to help recover after a workout or to simply fuel your day,2 and over 4g of dietary fibre — perfect for an on-the-go snack you can enjoy anytime. When to enjoy Vegan Protein Bar? Whether it’s a quick pick me up or a post-workout refuel,2 they’re perfect for getting the daily protein you need, with that sweet boost you love. 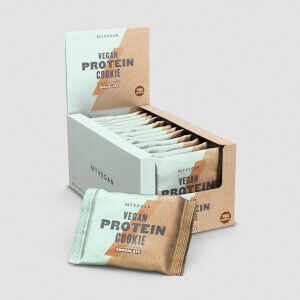 What to enjoy Vegan Protein Bar with? 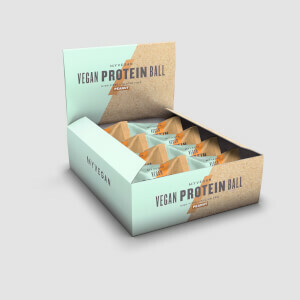 Our bars are a great way to top up on protein, but start your day with our Vegan Protein Blend — powered with pea, rice, and hemp, delivering the protein you need from an all-natural source. Consume as part of a balanced diet and a healthy lifestyle. Store in a cool, dry place away from direct sunlight. Suitable for vegetarians and vegans. Peanut & Maple Syrup Flavoured: Peanuts (30%), Pea Protein Isolate (15%), Cacao Butter, Chicory Fibre, Maple Syrup (7%), Brown Rice Malt, Crunchy Peanut Butter, Rice Protein, Carob (3%), Concentrated Fruit Juice (Grape), Rice Starch, Sea Salt, Green Tea Extract. For allergens, see ingredients in bold. May also contain tree nuts. Choc Chip, Nut & Vanilla Flavoured: Roasted Almonds (15%), Cashew Nut Butter (14%), Pea Protein Isolate (14%), Rice Protein, Chocolate Chips (10%) (Cocoa Mass, Sweetener [Xylitol], Cocoa Butter, Emulsifier [Sunflower Lecithin]), Agave Syrup, Chicory Fibre, Sweetener (Xylitol), Cacao Butter, Concentrated Fruit Juice (Grape), Rice Starch, Vanilla Extract, Green Tea Extract, Sea Salt, Antioxidant (Vitamin E). For allergens, see ingredients in bold. May also contain peanuts. Chocolate, Cashew & Orange Flavoured: Cashew Nuts (19%), Rice Syrup, Rice Protein, Pea Protein Isolate (11%), Chocolate Chips (10%) (Cocoa Mass, Sweetener [Xylitol], Cocoa Butter, Emulsifier [Sunflower Lecithin]), Sweetener (Xylitol), Chicory Fibre, Cacao Butter (6%), Concentrated Fruit Juice (Grape), Rice Starch, Cashew Nut Butter, Cacao Powder, Green Tea Extract, Orange Oil, Sea Salt. For allergens, see ingredients in bold. May also contain other tree nuts and peanuts. The nutritional information is based on the Choc Chip, Nut & Vanilla Flavour, when choosing an alternative flavour the nutritional values may vary. Individually wrapped gluten free snack bar with peanuts, maple syrup, pea protein isolate and carob. Individually wrapped gluten free vanilla flavoured snack bar with chocolate chips, roasted almonds, cashew nut butter, pea protein isolate and with sweetener. Individually wrapped gluten free orange flavoured snack bar with chocolate chips, cashew nuts, cacao butter, pea protein isolate and with sweetener. Proper to turning vegan, I've tried MP bars and wasn't impressed. Honestly didn't expect much from these ones, only got them for the convenience. When i opened the box, i was shocked by the miniature size of these bars. However, it took me one skeptic bite to fall in love with them! They taste as natural as they claim to be, not overly sweet like lifebar or nakd bars, or any other bars for that matter! Texture is similar to a brownie than a bar. Only wish they decreased fat a bit and increased the protein levels. Would buy again regardless. Their taste and texture easily beat any bars (vegan/non vegan) out there. P.S: I've tried all sorts of bars like quest, fit crunch, musclepharm, etc... this beats them all in terms of taste and texture. Always been on top of my diet and gym but protein bars are a go to snack for me as I travel a lot and it's hard to keep on top of meals sometimes... I used to enjoy Quest bars back in the day (so pricey in the UK) and since going Vegan, I wondered if there was anything similar on the market. Ordered these on a whim and they are great! Didn't expect to like them this much. Closest thing to a Quest bar I've tried, they are chocolatey and yummy (cashew/orange flavour)! Love the little chocolate pieces inside, makes you feel like you're indulging a little. I will definitely buy more when I use up all these. These are very similar in taste and texture to the Pulsin vegan protein bars, but work out a lot cheaper. These are not as tasty as the MyProtein vegan cookies, but have a much lower sugar content so are something I'd probably eat daily. I got the Peanut and maple flavour ones, which is all fairness taste ok, they are just so small and 227kcal per bar. Also pretty high in saturated fat for the size, so i won't be ordering these again. These have great ingredients (nothing weird) and taste fantastic. I bought the orange flavour, great with coffee. I love chocolate orange flavoured things so went for this flavour rather than the others and I am really impressed - they're way better than I thought they would be! I feel like I am just eating a chocolate bar, they're a good size and leave me very satisfied afterwards. If you love chocolate orange things then definitely give these a go! 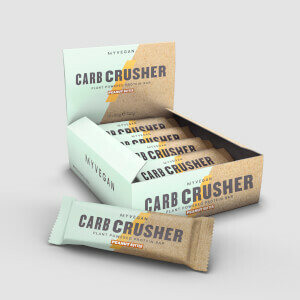 The texture is great, no grittiness, they are just perfect, well done MyProtein.